It might be amazing to hear, but there are still those out there who think Sebastian Vettel isn't all that. Yes I know, it seems astonishing given he's three world championships along at just the age of 25. It also seems amazing given the regularity with which he demonstrates fairly unequivocally that he is all that after all. But the arguments are familiar: he's over rated, it's all the car etc etc. Perhaps those that claim such don't watch F1 very much. Or else are otherwise engaged (perhaps washing their hair?) on the days such as today when Seb does underline a few of his talents with thick black lines. It of course couldn't possibly be the case that they are guilty of only seeing what they want to see - could it? Yes reader, Sebastian Vettel did indeed emerge on top in today's Canadian Grand Prix qualifying session, and in so doing showed many of those talents that I made reference to. 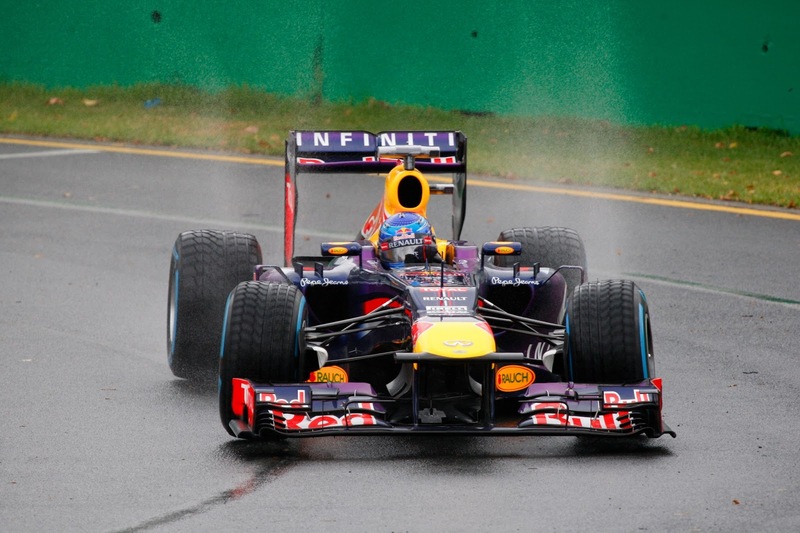 It rained on and off throughout the hour (no less than the fourth qualifying hour of seven in 2013 to feature precipitation), meaning the track was damp for the duration but at something of an varying level. This resulted in rather a lot of tip-toe progress as drivers, also no doubt with the Circuit Gilles Villeneuve's nearby walls in mind, felt their way cautiously. Well, 21 of them did anyway. For young Seb alone the track seemed almost un-slippy, and despite the rotating top order that is often the case on such days he always seemed capable of blitzing whatever times had been set before, almost contemptuously. Sure enough, by the end of it all he remained on his pedestal. Of Seb's many virtues possibly the most impressive is that on days when the level of grip is uncertain his confidence is supreme, as is his ability to find the limit immediately a lot like someone has flicked a switch. All this was on full beam in Montreal qualifying. Furthermore it is a continuation of a season wherein Seb's been able to make the very best of things just about everywhere. Not even the Mercedes Saturday juggernaut could beat Vettel today, though Lewis Hamilton pedalled hard and came a close second in the end. Indeed, he felt he might have actually denied Seb pole but for an error on a later lap. While Nico Rosberg was behind for once, and will start fourth tomorrow. Between the two Mercs on the starting grid we have the other star of qualifying, and a far less widely anticipated one. Valtteri Bottas arrived in the sport at the start of this year in a blaze of mooted potential, but the underperforming Williams FW35 has rather cloaked whatever light that may be there. Today's rain gave Bottas his opportunity, and those who'd done their homework on him knew all about his ability to adapt and his resultant speed in the wet. Sure enough he was quick throughout and by the end of the hour ending up third didn't seem especially incongruous. Bottas himself admitted that without the heavens opening he wouldn't have been near that slot, so it shouldn't be heralded as a Williams revival yet, but it remains a worthy effort. 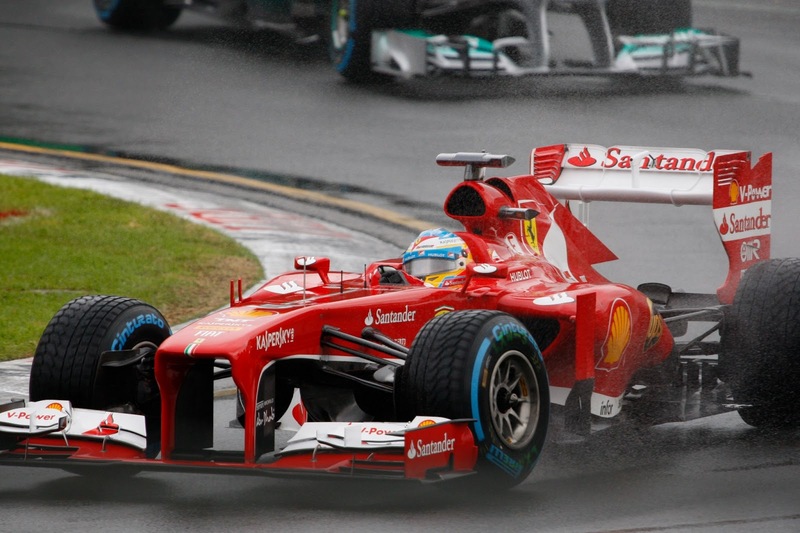 If the rain stays away is Alonso the man to watch tomorrow? So what of tomorrow? If it remains dry then perhaps the one we should be keeping our eyes on hasn't even been mentioned yet. The evidence of Friday's running on a dry track was that the Ferrari - or more to the point Fernando Alonso's Ferrari - looked the quickest thing out there. He'll start tomorrow in sixth place, related to the not unreasonable suggestion by driver and team that their F138's virtue of not putting much heat through its tyres becomes a vice on cool, damp days when heat needs to be got into the rubber quickly. This left Alonso driving as if on ice (and Felipe Massa went further with firm contact with the scenery in Q2). Thus if it does not rain tomorrow the key story of the race may be how quickly Alonso can clear the traffic to have a crack at Vettel. And in these circumstances there is some reason to think that things could open up to him: Bottas and probably the Mercedes (given what seemed on Friday to be their continuing tyre troubles) are expected to clear out of the way pretty quickly. Which leaves Mark Webber, who often doesn't get off the line all that well and in any case may not be minded to help his stable mate unduly, given everything. If it does rain tomorrow however (and showers are forecast) then there's probably little point in trying to predict anything. One recalls the 2011 race here on a similar day, which was one of the most madcap in history. But on second thoughts things might not be that hard to predict. If it rains - perhaps even if it shines - Sebastian Vettel looks rather well-placed. Yes, you wonder sometimes what Seb has to do exactly to convince the doubters out there, he demonstrates repeatedly that it's not just about the Red Bull with him. But then again perhaps there'll always be those who insist on having a bogeyman! What do you think, will rosberg be able to better hamilton again this season or will hamilton gallop away as he gets the team to build a car more to his liking? Got to agree with the guy above, this is a great blog. I find myself coming back after each grand prix to know your take on the weekends happenings. The "guy above's" back =) I've been a Rosberg fan since Bahrain 2006, and while people point to his NOT putting Webber in the shade as proof of his not being particularly good - I think the fact that Webber Retired 11 times that Year (Rosberg - 9), points to the Williams being a truck. On top of which Rosberg's given me the impression of improving year after year (Barring the second half of 2012). Hamilton actually feels like he's been quite up and down, and never really gotten better than he was in 2007 (Which was a pretty high standard - a rookie battling the 2-time incumbent down to the wire is pretty good!). All said and done, I think Hamilton is just a tenth or two faster than Rosberg on each of their best days. I seriously doubt either of them will be "destroying" the other over the course of the season (I've seen that opinion on quite a few forums). Got to agree with the 'guy above' once again:). Rosberg has kept up so far with Hamilton this season. He may just earn another fan if he gets a couple of more pole to podium finishes. That said the battle for drivers championship looks set to be really engrossing this season with Vettel, Alonso, Raikkonen and even Hamilton getting reasonably competitive cars. Looking forward to a keenly contested finish to the f1 season. I agree broadly with what's been said. My suspicion is that over the season Lewis Hamilton will get on top of Nico Rosberg at Mercedes, particularly as he gets the car (particularly the brakes) more to his liking. But I also agree that it's not going to be a rout by any stretch of the imagination, and that there'll be plenty of weekends wherein Rosberg will be the pace-setter. I'm one of many who's been eating humble pie regarding Rosberg this year. I'd for years wondered if he wasn't all that, but he's proving me wrong this year! Perhaps I had been swayed by 2006, but we shouldn't forget Rosberg was young then, just 20.